I thought for today’s post, I’d share an ongoing development in chess – China’s sudden emergence as one of the world’s strongest national teams. China really caught my eye this summer with Wei Yi’s immortal game against Bruzon Batista, in addition to their 29-21 thumping of Russia last July. While the national team lost steam in their match against eventual World Cup winner Sergey Karjakin, I feel like the World Cup tiebreaker between Wei Yi and Ding Liren more than demonstrated the true strength that the country has to offer. China has had a lot to offer to chess over the last few years, but their top players haven’t emerged at the top level tournaments on a regular basis (i.e. Sinquefield Cup, 2015 FIDE Grand Prix, Gashimov Memorial, etc). 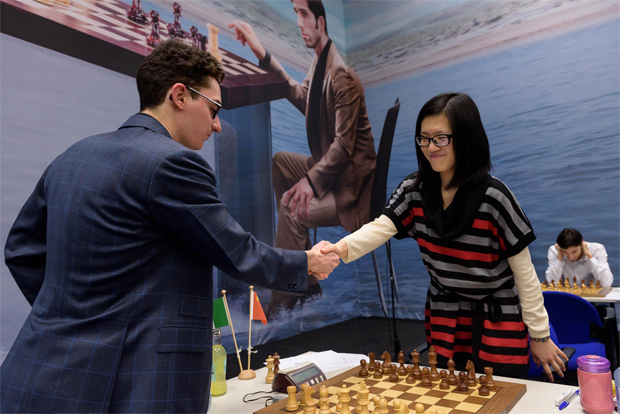 Former Women’s World Champion Hou Yifan may prove to be an exception, but her performances in the recent Tata Steel and the Dortmund Sparkassen Chess Meeting proved she has a long ways to go to compete with the very best. Two time Women’s World Champion Hou Yifan may be one of the most famous players in China besides Wei Yi, but who else is ready to compete at the top level? When I was younger (seven years ago), I remember hearing a lot about Bu Xiangzhi through the Internet Chess Club summaries of major tournaments – particularly a game he played against Vassily Ivanchuk, where he managed to lose in the first nine moves! Bu for the most part has not been active on the highest level since 2010, but since then, quite a few young players have drawn the spotlight of the Chinese chess scene: Wei Yi, Wang Hao, Ni Hua, Yu Yangyi to just name a few. 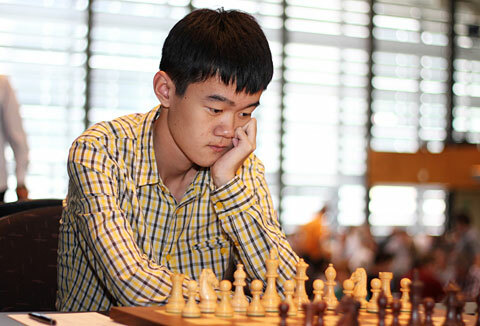 At sixteen, Wei Yi is already being compared to Magnus Carlsen. Can the fan favorite live up to the hype? I think that the recent renaissance of chess in China will see it offer a challenger to the World Chess Championships within the next four years. You’ve probably (and hopefully) already seen Wei Yi’s immortal game, so here are two games by two different Chinese Grandmasters that I think have a lot of potential in the near future. Even if this is true, Ding Liren is still the 8th best player in the World, and of all the players on the Chinese National team, the most deserving of international attention. Back in January, Ding tied for second in the Tata Steel with 8.5/13, only a half point behind Magnus Carlsen. In that tournament, Ding posted 7 wins (more than any other of his adversaries) including victories over Radjabov, Aronian, and Wojtaszek. In his book, After Magnus, Anish Giri praises Ding Liren as “one of the best players of our time”. Its only a matter of time before Ding Liren qualifies for the Candidates tournament. 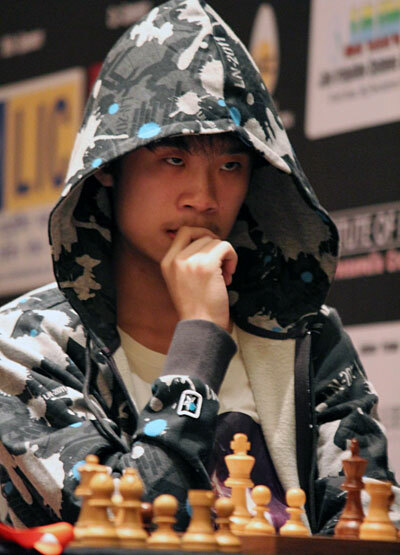 The real question is, will Wei Yi beat him there? Gelfand grabs a tempo here to gain space, but the downfall to making this b7-b5 push is that the c8 bishop lacks active squares. 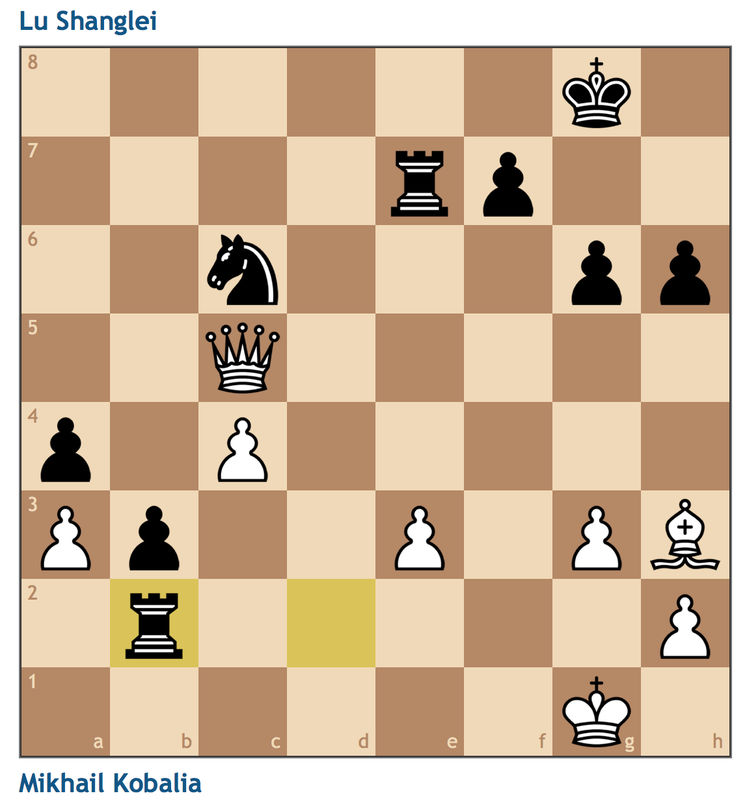 Ding Liren plays b2-b4 to stop any opportunity for Black to play c6-c5. 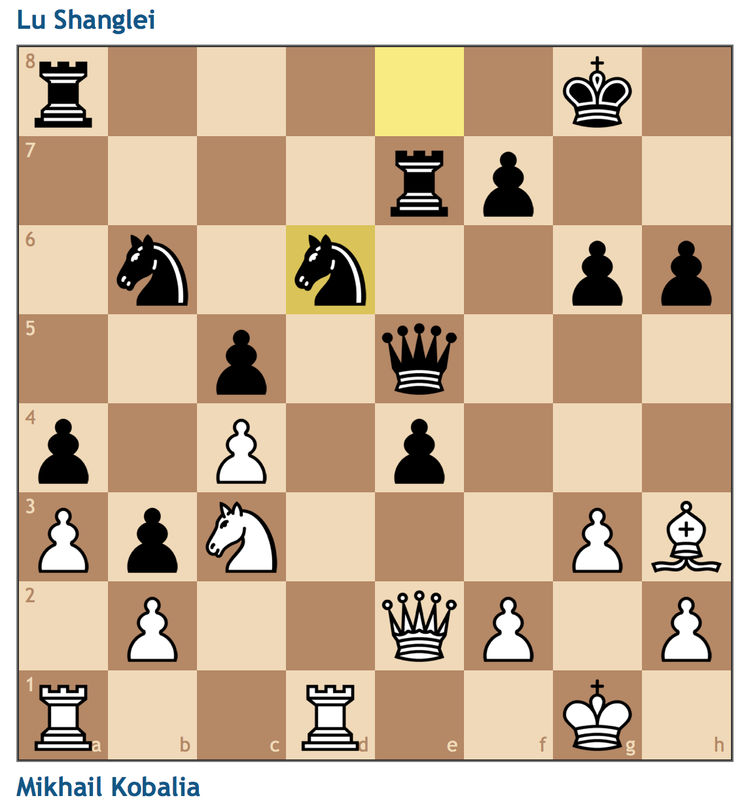 If Gelfand can open this long light square diagonal, he can put a lot of pressure on the f3 knight. 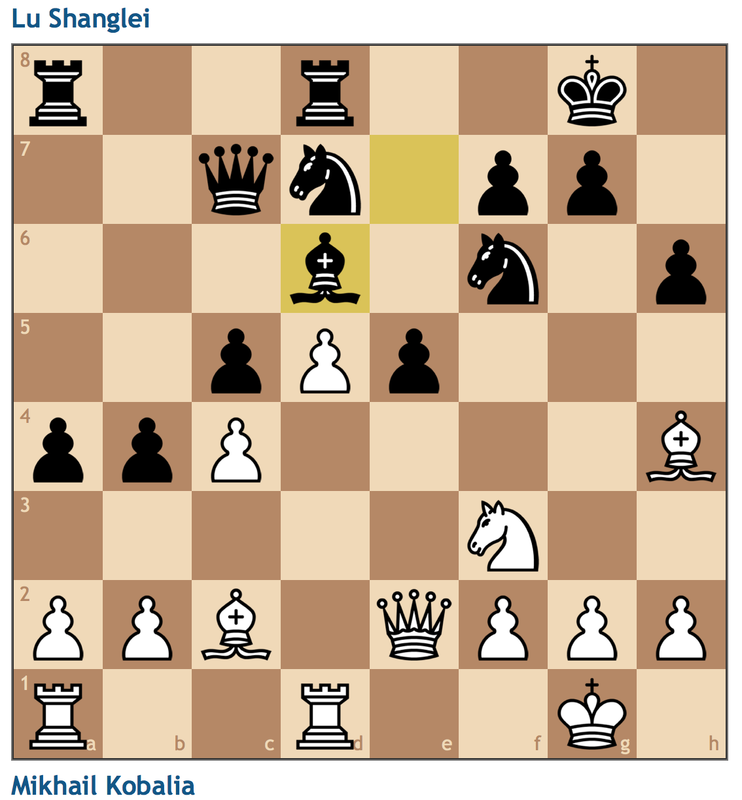 Definitely the right way to take as cxd5 would forever block in the b7 bishop and create an isolated pawn on b5. This move does have its own problems though. Black’s bishop on b7 will likely need to relocate back to c8 to become active, and Gelfand now has a backwards pawn on c6. 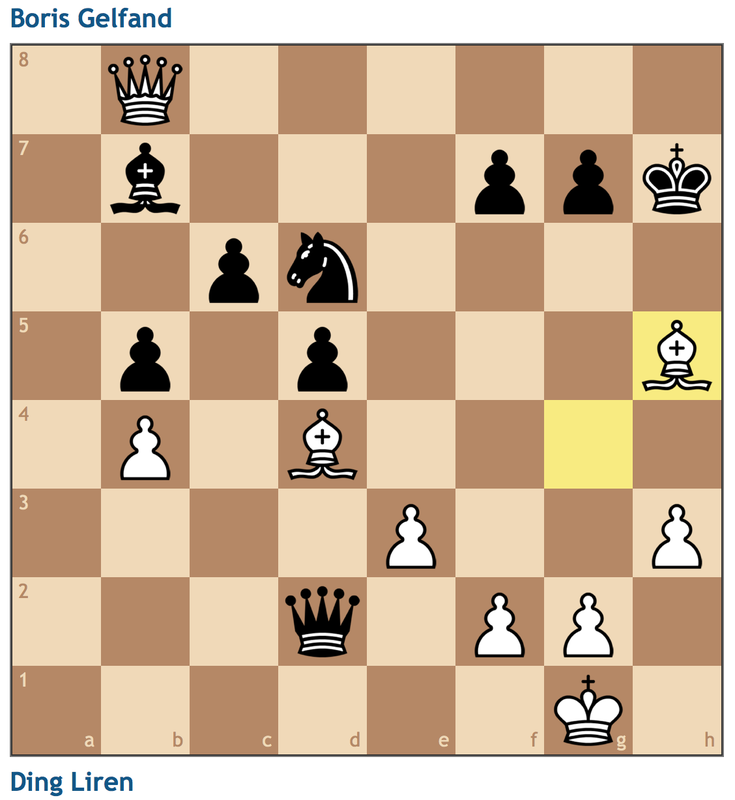 White has a weak pawn and a bad c1 bishop, but I prefer White here. A positional pawn sacrifice. 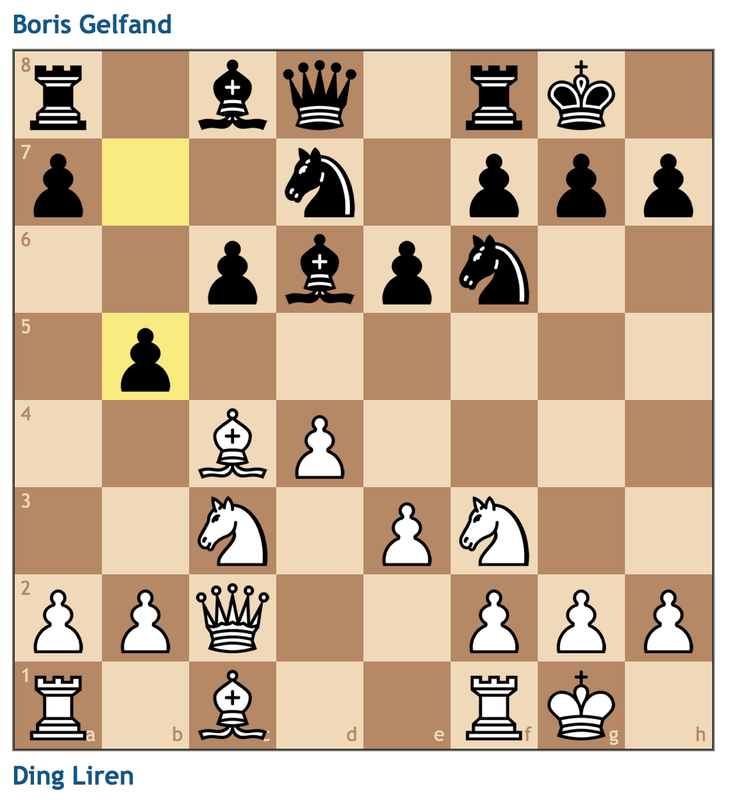 By clearing the d4 square, White begins to open the long dark squared diagonal for his bad bishop. Meanwhile Black still has yet to solve his problems. 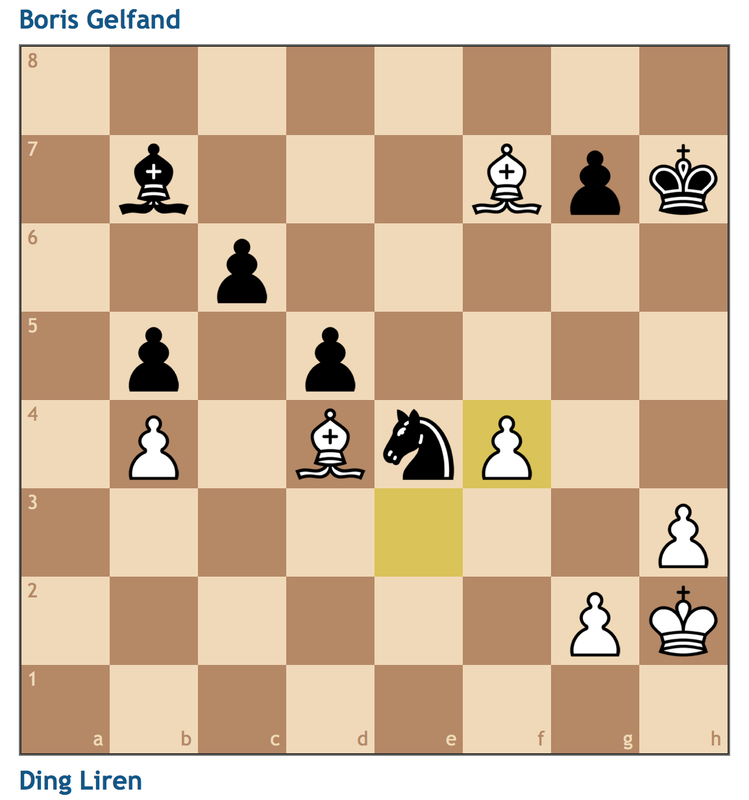 Black’s knight on c4 seems annoying but it really doesn’t pose a threat to White’s position. Black’s pieces are not coordinated while White’s bishops bear down on the kingside and the queen can attack from the sides with the a-file. White bites the bullet. In all honesty, Black is playing down a piece and White’s defenses are too strong. White invites the queen trade. With the bishop pair, Ding Liren takes no risks in this endgame. 39…Nd6 40.Be6 Bc8 41.Bxc8 Nxc8 42.Bc5! The final straw. 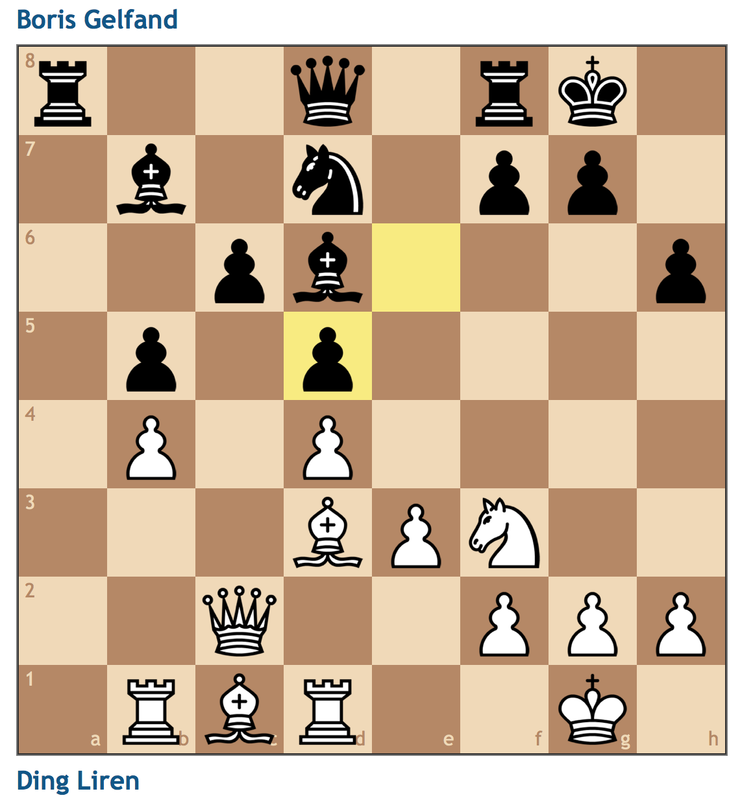 White’s bishop covers all of the knights squares and leaves Gelfand in passivity as Ding gets the time he needs to advance his kingside pawns. 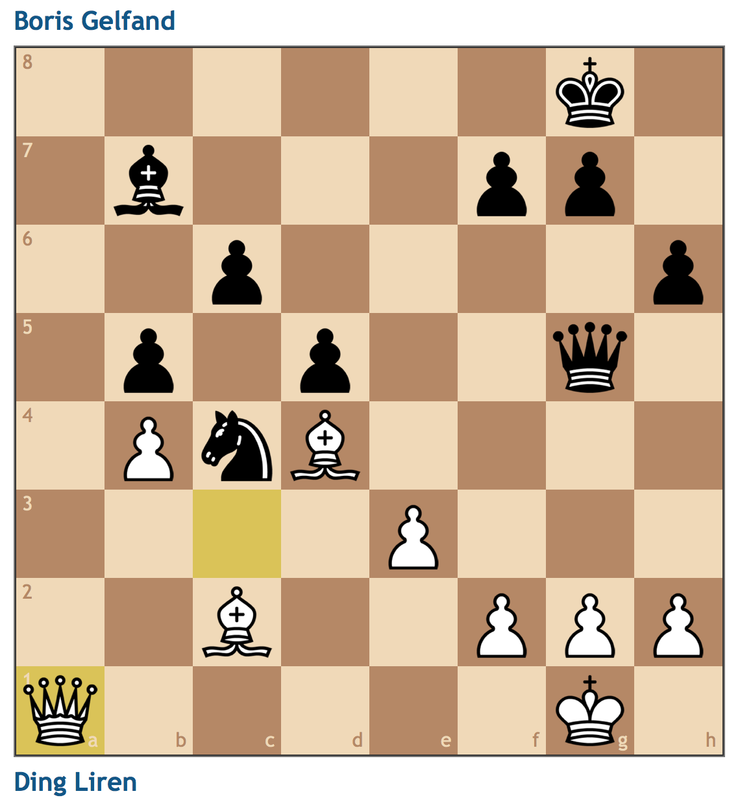 Gelfand resigns here as every move loses. For instance, if 47… Ke4 48. Kf2 Kd3 49. f6! and either the f- or the h-pawn will promote. if 47… Kf6 48. Kf4! The pawn isn’t going anywhere 48…d3 49. g5+ Kf7 50. Ke3 and Black cannot defend the kingside march. A nice display from Ding Liren! In the New in Chess article about Ding Liren, there was mention that Gelfand was injured after two draws into the match, but I don’t think that it takes away from the quality that Ding brought to this game. 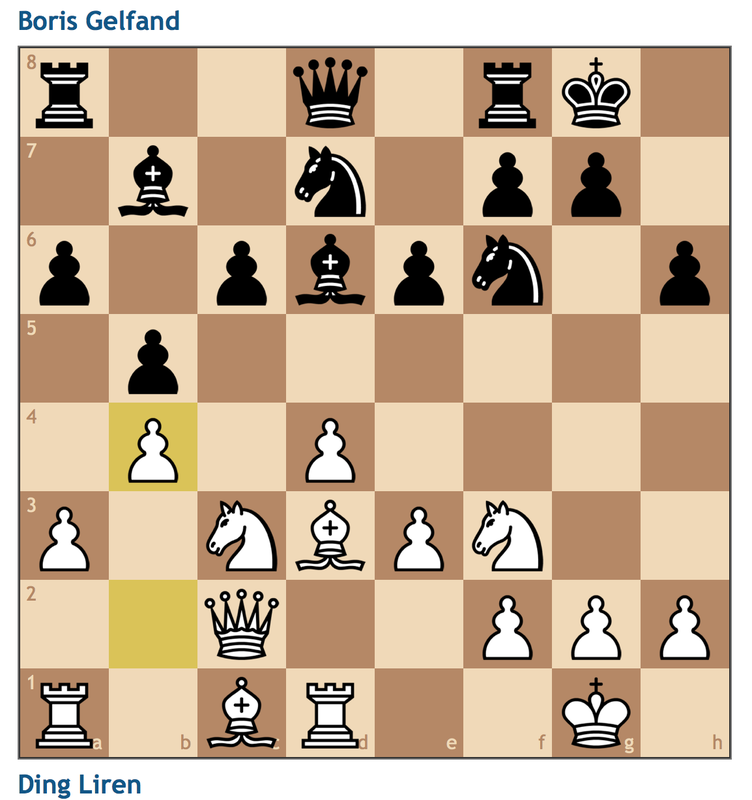 From what was seemingly an equal position, Gelfand was constantly punished for having a bad light square bishop, while White managed to sacrifice a pawn for activity. Instructive stuff! If you’ve heard of Lu Shanglei before, I’m quite impressed. To be quite honest, he only caught my attention when he held Veselin Topalov in the 2015 World Cup to force a tiebreak. 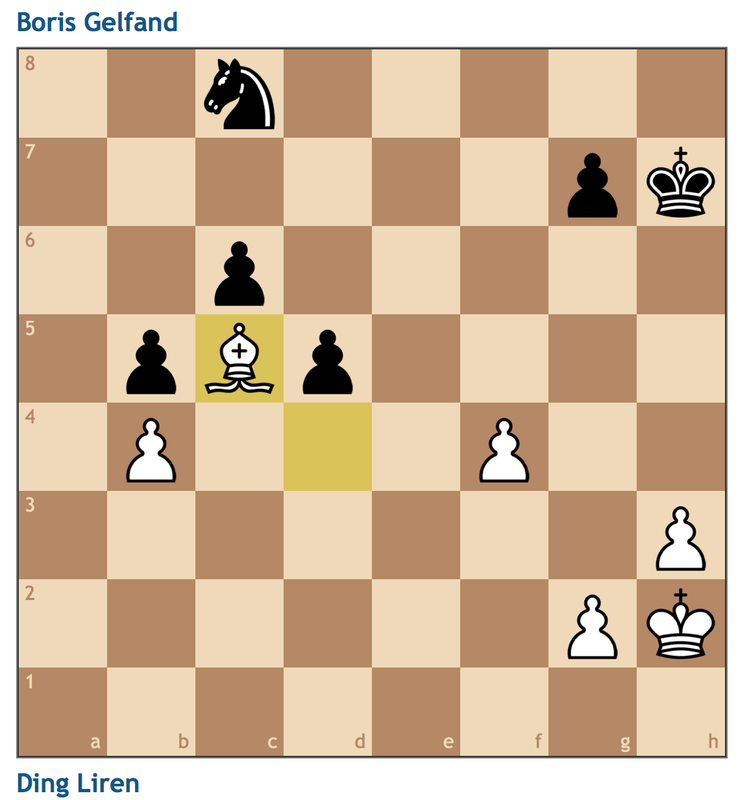 Despite losing that match, Lu pushed Topalov to the edge, and the duration of that match likely played a small role in Veselin’s exit the following round against eventual finalist Peter Svidler. 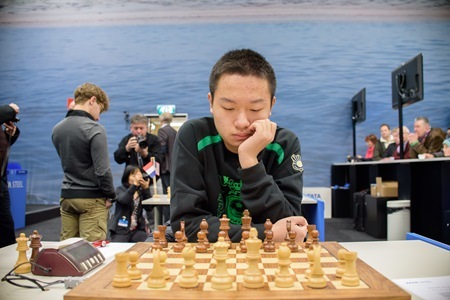 A relative unknown to the greater chess world, Lu Shanglei is the 16th best blitz player in the world, making his 2599 standard rating seem extremely deceiving. I don’t think he’ll be playing for the candidates tournament anytime soon, but at the age of 19, I think he will have plenty of time to reach 2700 and play with the best. Lu Shanglei proved he can take the world’s best in the recent World Cup. How will he build on that performance? 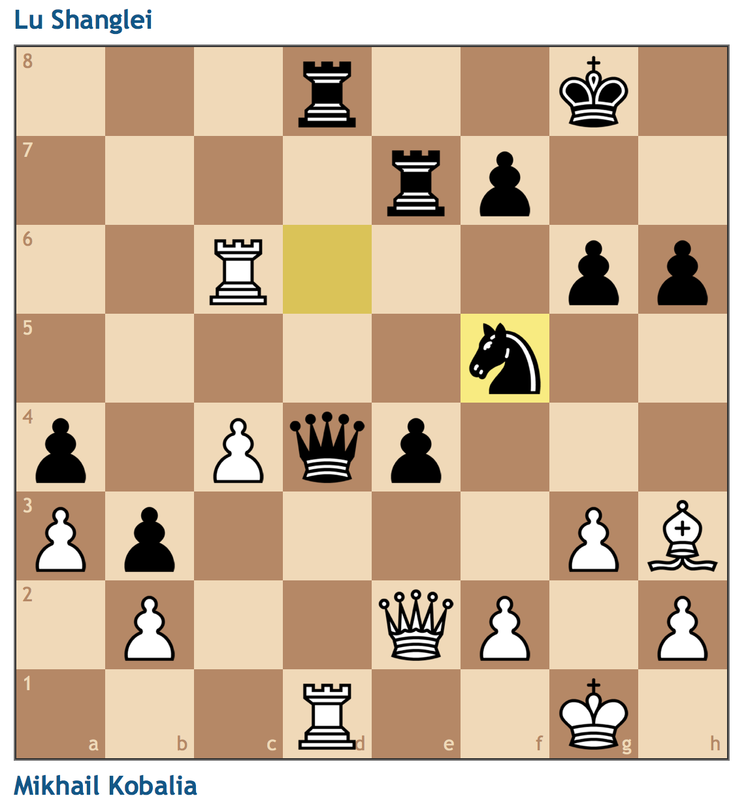 We’ve reached a critical position where Black has a weak d5 square, but White is behind in development. Lu Shanglei hopes to use combined pressure against the e4 pawn and the d-file to get an initiative. I don’t think I like this move. 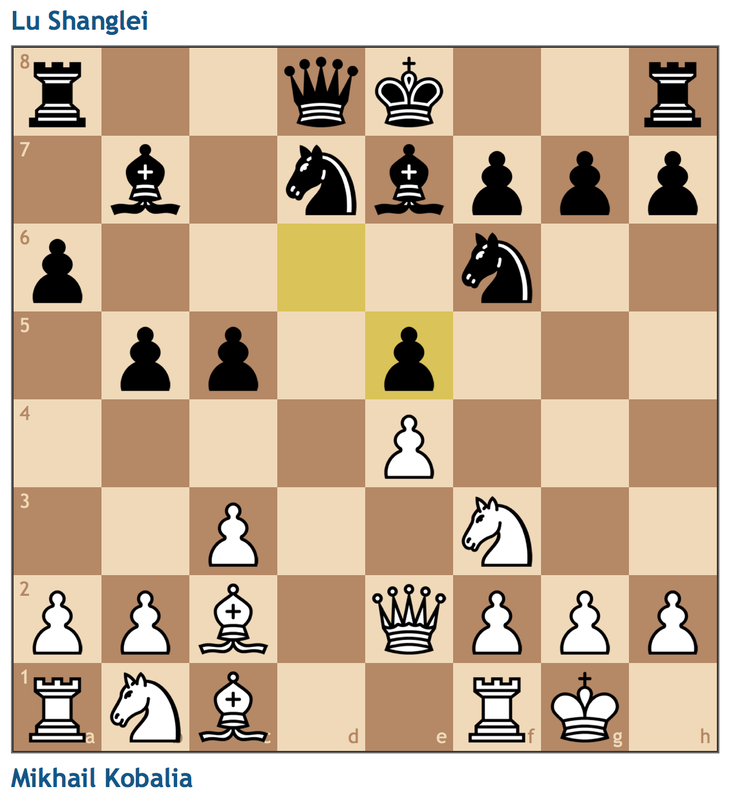 White’s trump in the position was that he could play for d5 while the d4 square was covered by the c3 pawn. With this move, Kobalia surrenders his hold on the center and suffers a space disadvantage. The point of taking on d5. Lu Shanglei places his bishop on d6 to blockade the passed pawn while creating the threat of e5-e4, putting pressure on h2. 20.Bg3 Re8 21.Bf5 Nb6 22.Nd2 e4!! A brilliant shot! 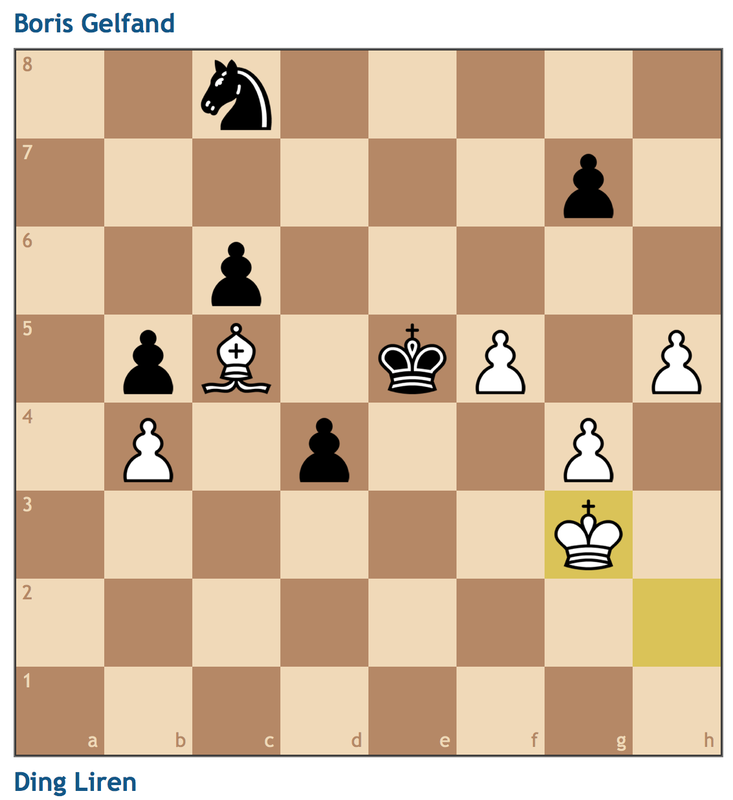 White cannot take the pawn thanks to the pin on the e-file. If 23. Nxe4 Nxe4 24. Bxe4 f5! and the pressure is just too much. White makes a short-term pawn sacrifice, but in the last few moves, its become increasingly clear how weak White is in the center. 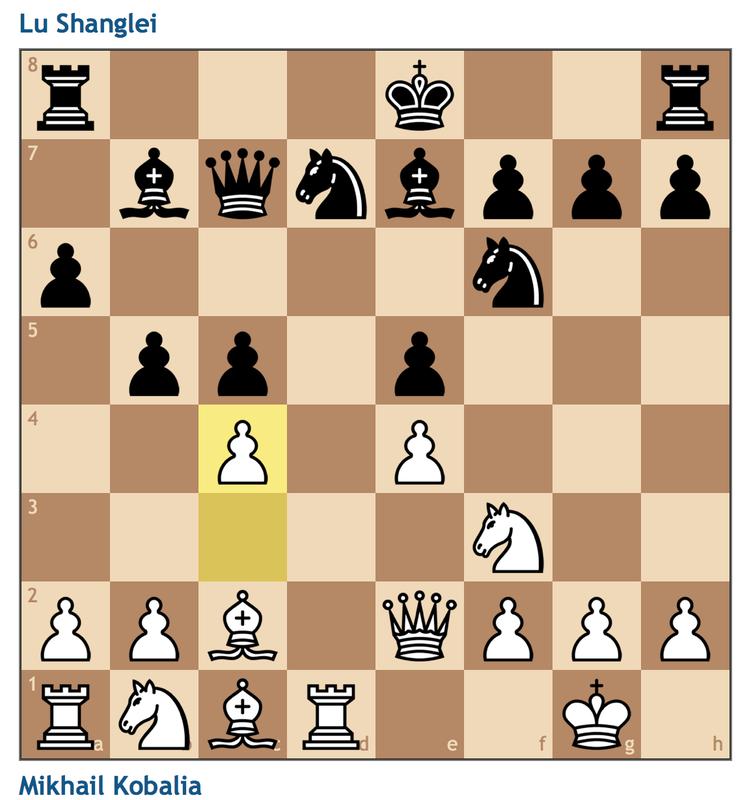 With moves like …b3, Lu Shanglei has made the pawn on c4 weak while dominating the long dark squared diagonal. 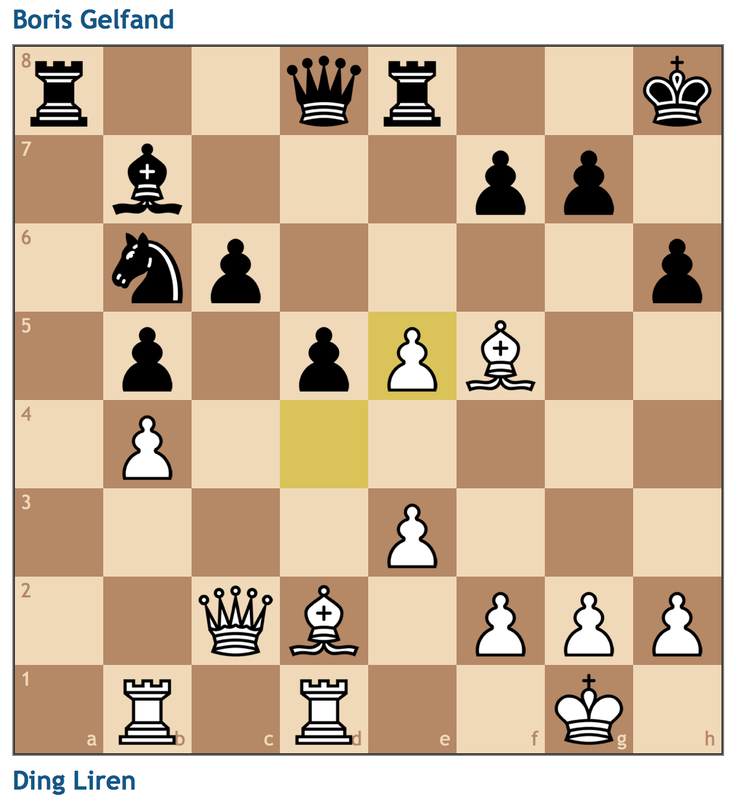 30.Nd5 Nxd5 31.Rxd5 Qf6 32.Rxc5 Qd4 33.Rc6 Rd8 34.Rd1 Nf5! Brilliant! Black is winning in all lines. White has nothing better than give the two rooks for the queen. Who needs knights? Here the passed b3 pawn is the much bigger threat, and White lacks any coordination to do anything with his short-term material advantage. A great display from Lu Shanglei! What made this game truly enjoyable for me was how he was able to combine long-term positional strategies with tactics to seize the advantage. 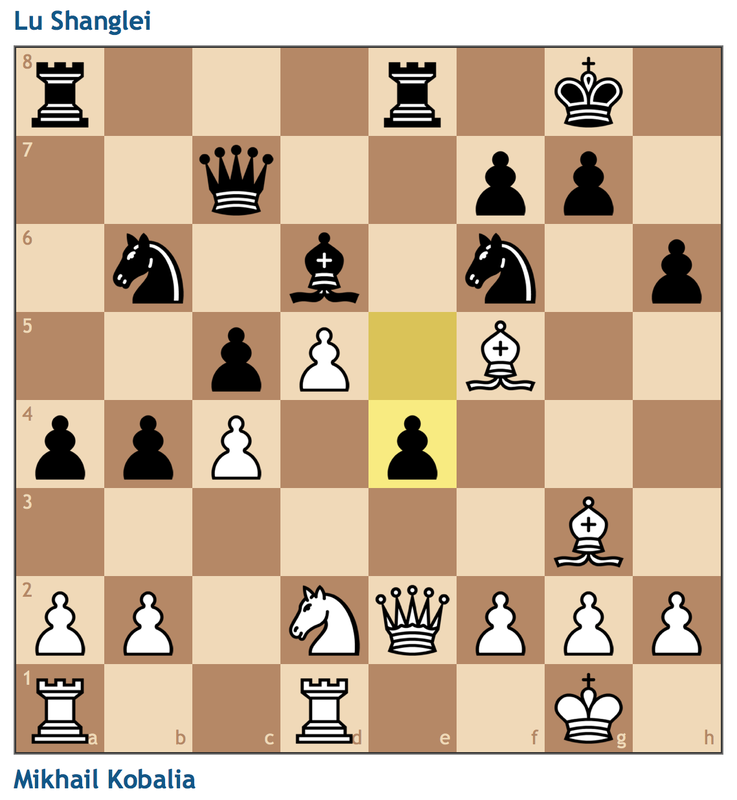 Once White tried 12. c4, Black’s play seemed really fluid, and Kobalia really wasn’t able to make a real effort to win the game. If anything’s clear, its only a matter of time before the best of the Chinese team make regular appearances at the top level. The thought of Yu Yangyi, Wei Yi, or Wang Hao taking on a Fabiano Caruana or Maxime Vachier-Lagrave is already making my mouth water. Like this article? Make sure to check out my gofundme page to help me get to New Orleans for the 2016 US Junior Open!